OTTAWA -- Both China and Russia will be integral to securing peace on the Korean peninsula, Prime Minister Justin Trudeau conceded Monday even as he defended the decision to leave the two countries out of this week's international gathering on the perils posed by North Korea. Trudeau made the remarks after Russia became the latest to slam the meeting -- taking place Tuesday in Vancouver and co-hosted by Canada and the U.S. -- as a threat to peace efforts. China, meanwhile, has already derided as "Cold War thinking" the involvement of only those allies that supported South Korea during the Korean War. 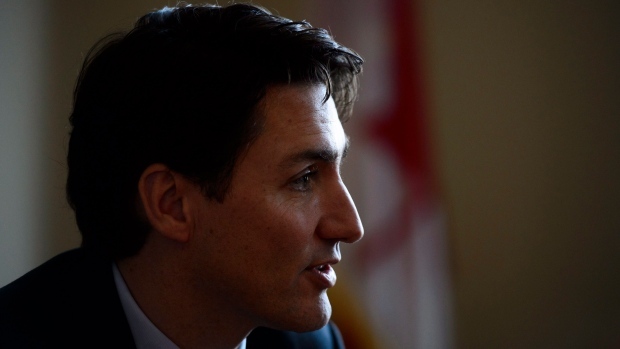 "There are always going to be different venues and different groupings happening, and I think a diversity of approaches is better than picking one lane and deciding that this is going to be the way it happens," Trudeau said in an interview with The Canadian Press. "This is an opportunity to gather together a group of nations that are historically linked through the Korean War that will be another piece, we certainly hope and feel, in the path towards resolving the conflict." But Trudeau also acknowledged that any successful resolution will ultimately need to include China and Russia, both of which he called "important partners" in resolving one of the world's greatest threats to peace. Foreign Affairs Minister Chrystia Freeland and U.S. Secretary of State Rex Tillerson last month announced plans to co-host the Vancouver meeting in response to growing concerns about North Korea's nuclear and missile programs. The meeting has sparked plenty of condemnation, most recently from Russia, whose foreign minister didn't pull his punches Monday in a two-hour news conference. "We openly said that we think this meeting is harmful," Sergey Lavrov said, echoing earlier sentiments from the Chinese government. U.S. officials have suggested that while not invited, Russia and China were generally supportive of the decision to hold a meeting in Vancouver. Lavrov described such assertions as "an outright lie." He also questioned the list of 20 countries invited to attend, all of which supported the UN force that fought against the North Koreans, Chinese and Russians during the Korean War from 1950 to 1953. Similar sentiments have been expressed by the Chinese foreign ministry and even a Japanese official, raising questions about the purpose of the meeting -- and its likelihood of success in curbing North Korea's nuclear program. U.S. officials have previously said the meeting will look at ways to crack down on the many smuggling and money-laundering schemes that Pyongyang has employed to sidestep sanctions and pay for its nuclear program. Sanctions continue to be a critical point of leverage for the international community over North Korea, said Eric Walsh, Canada's ambassador to South Korea. The challenge remains the sheer number of sanctions and the resulting patchwork of implementation, Walsh said Monday during an event at the University of British Columbia. "One of the things we want to do is look at how we can improve enforcement, how we can identify where sanctions are being evaded and maybe give some assistance to countries," he said. U.S. officials have said the discussions will include whether to start intercepting North Korean shipping, which is certain to spark anger and threats from Pyongyang and could involve Canadian warships. Underlining the military backdrop, Defence Minister Harjit Sajjan and U.S. Defense Secretary James Mattis were scheduled to attend a dinner with Freeland and Tillerson on Monday night in advance of Tuesday's gathering. Yet Walsh said the meeting will include a significant focus on potential diplomatic avenues given by bringing together various countries that agree North Korea is a big challenge, but don't necessarily see eye-to-eye on other issues. "We want to think practically ... about how we can improve prospects for a diplomatic solution and create space for long-term stability and prosperity on the peninsula," he said. "I think we'll get a more nuanced sense of what diplomatic options may be available to us." NDP foreign affairs critic Helene Laverdiere on Monday called on the Trudeau government to emphasize diplomacy during the Vancouver meeting, especially in the face of the Trump administration's "dangerously bellicose rhetoric." "It is more important than ever for the Canadian government to chart a very different course," she said, "and assert to governments around the world that diplomacy is paramount, even when economic sanctions are underway." With reporting from Laura Kane in Vancouver.